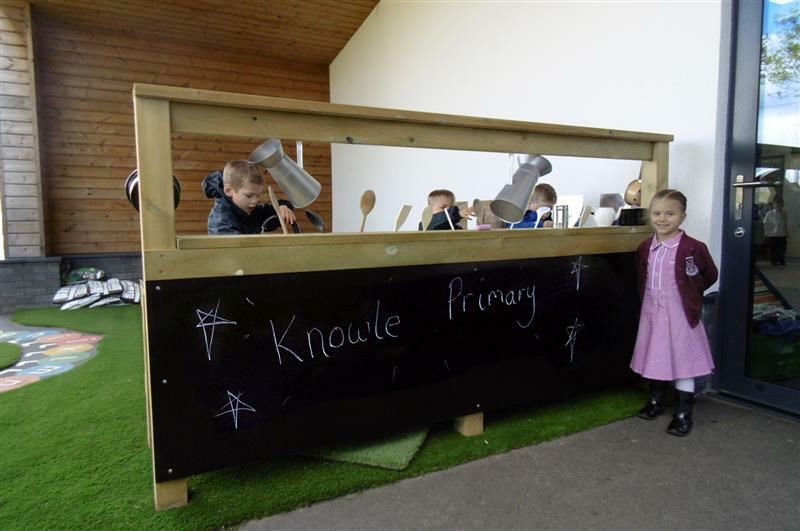 Our outdoor learning consultant, Becky Hazell, worked with Knowle Primary School to turn their outdoor area into a child-led learning environment that combines the zoned learning charactersied by the Early Years Curriculum. 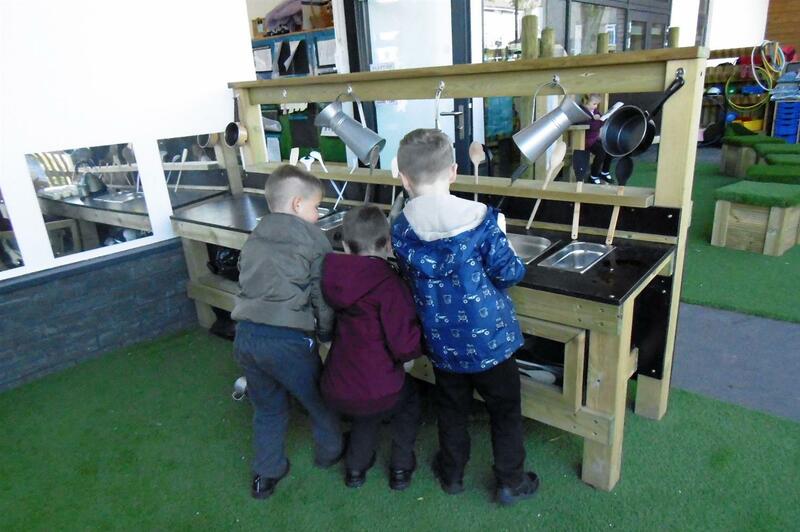 After working closely with the school, we created an outdoor classroom jam-packed with cross-curricular activities that the children can self-select from. 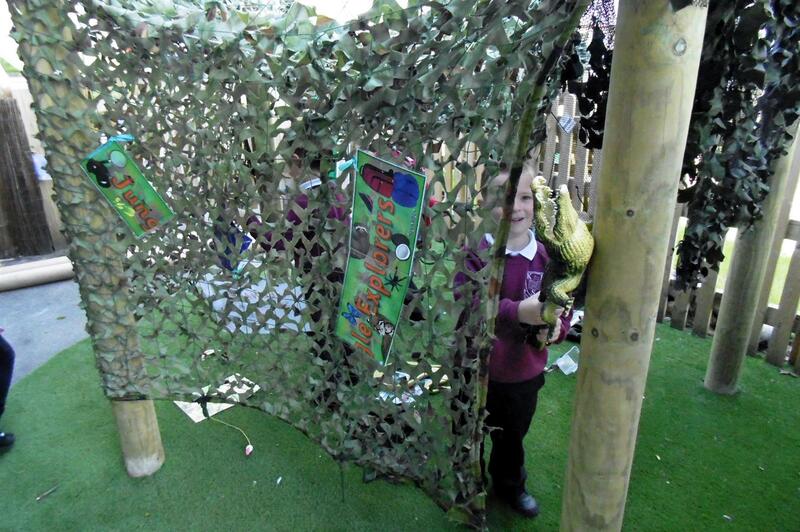 The children now have a tremendous amount of opportunities for sensory, physical and imaginative styles of play. We decided to turn the main area of the playground into a zone for physical and gross motor skill development. To help build the children’s climbing confidence, we created a small trim trail over artificial grass surfacing. The trail includes low level challenges that focus on children’s foot placement, balance and fine motor skills. As the early years children begin using the equipment, they will begin to accustom to manoeuvring across different sized obstacles. To further make use of the huge amount of space in this area, we also incorporated a roadway track that manoeuvres around the trail. This is a fun way for children to use their bikes and trikes and improve their understanding of the world by learning the rules of the road. 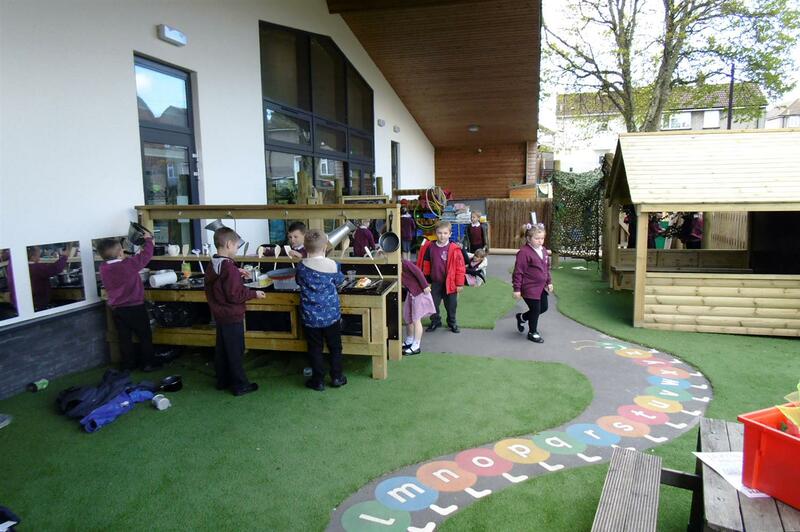 You can view our range trim trails and active play equipment here. We installed our Mud Kitchen and Dig Pit together to create a zone that would help develop children’s understanding of the world. These resources will also encourage children to communicate and work in teams… if the kitchen is low in mud, who has the job of collecting ingredients from the Dig Pit? The children will also love using their imaginations to turn this space into the world’s greatest restaurant and role play as chefs and waiters. Moreover, our Mud Kitchen includes a chalk board top where high frequency words or CVC words such as 'hot' and 'mix' can be added. This helps increase children's early exposure to written language. We surfaced this area with artificial grass to make cleaning easier for teachers and children. A zone focused on communication, language and PSED. 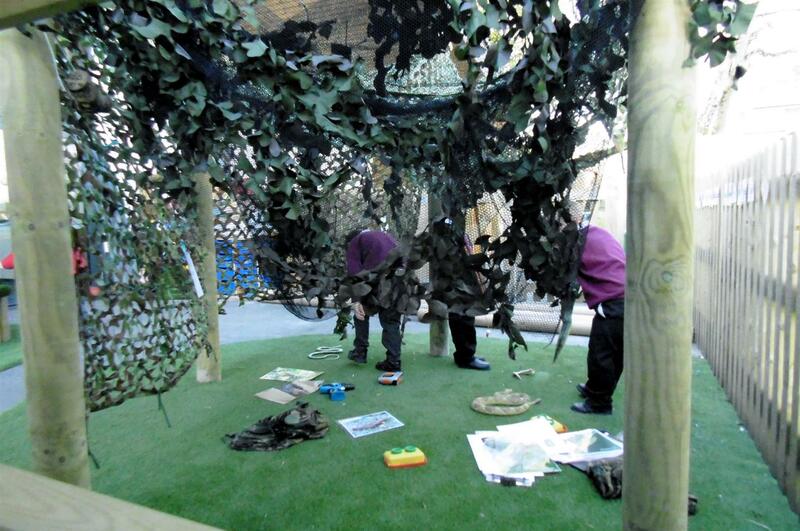 We developed this area to focus on children’s personal, social and communication skills. 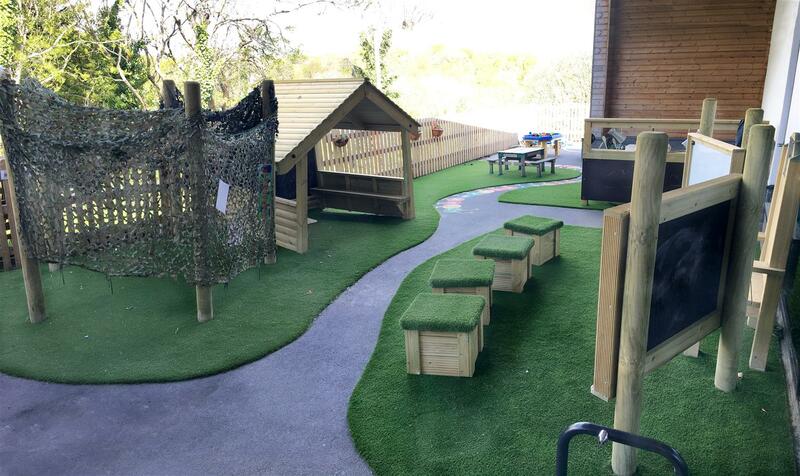 The area includes Den Posts and a Giant Playhouse that provide enriching opportunities for problem-solving, role play and interaction with their peers. Our Large Covered Sand Box was also added to the area to further encourage interaction between children. They will explore the sand together and marvel over the many characteristics that sand brings. Children will be able to apply and refine important personal skills through independent learning in this zone. You can view our large range of imaginative and creative products here. This area is designed for both directed time and independent learning. We included a giant chalkboard and whiteboard to create a perfect setting for learning about numbers and letters. These are installed at child height to ensure children can independently take part in mark-making or placing magnetic resources as part of their learning. We also made our Story Telling Chair the focal point of the area, encouraging children to read their favourite stories to one another. This is a great way to build children’s confidence and develop their spoken language. Take a closer look at our Story Telling Areas here. To give the children even more choice during play. we added both a Sand Table and Tuff Spot Table. Our sturdy Sand Table is elevated by strong wooden legs that enables children to play while standing, allowing for fluid movement around the table, which helps tremendously in reducing feelings of frustration and leaves the children more inclined to be inclusive and cooperative. The moveable Tuff Spot Table can be used as part of learning in all areas of the Early Years Curriculum. It is a great flexible product that can be used as part of directed teaching or set up specifically for independent learning. The beauty of our Tuff Spot Table is that is has storage underneath which allows the teachers to have resources that are easily accessible by the children and quick to set up. Also, feel free to message Liz on our Live Chat service who will be more than happy to answer any questions you may have.